MYO Healthy Chicken Broth - Easy and CHEAP Too! MYO Healthy Chicken Broth – Cheap & EASY! I made a delicious slow cooker chicken dinner recently. Now y’all know I like the Cook-Once, Eat-Twice method of cooking. So after supper I sectioned off the larger pieces of chicken into meal-sized servings, labeled them and put them into the freezer. That gives me chicken portions for two more suppers. I took the remaining smaller pieces and put them in the fridge for a Cheesy Chile Chicken casserole recipe I wanted to try later in the week. That’s THREE suppers worth of chicken left over even after we’d enjoyed delicious chicken for supper that night. But we’re not through yet – oh no. There’s still much more food left in that sad looking picked-clean bird. I’ve written before about making various broths. But today I want to make my own chicken broth. And there’s a special ingredient to make it more calcium rich. Check it out. I’ve made rich nutritious broth from steak bones for beef broth, turkey bones for turkey broth & of course chicken bones for chicken broth. I don’t have a specific recipe but that’s the beautiful part, you don’t really NEED one! I use lots of broth. It’s a healthy ingredient in my Endless Soup, my homemade Chicken & Dumplings and even a homemade version of Cream-Of-Anything soup! So here I am staring at this picked-clean bird and my thoughts turn to that delicious potential. Now in my earlier days this leftover carcass would have all been thrown away. But now it always goes for one more food product before it’s relegated to the trash. Gotta love it! After storing away all the leftover meat for future meals I tossed everything that was left into my slow cooker – bones, skin and even raw skin and trimmings I pulled from the chicken before I cooked it. I gathered all that chicken waste & into the pot it went. Then I filled the pot with water. Some people also throw in scraps of raw veggies like onion trimmings or the tips or peelings of carrots, etc. I usually don’t because I’m just using what I have on hand. But you certainly could add those things at this point as well if you wish. Now that my slow cooker is filled, I add a splash of vinegar. I’ve read that vinegar draws the calcium from the bones. (you can’t taste vinegar in the finished product). Now comes the grueling, hard, labor-intensive part. I flipped the switch on the slow cooker to High and let it simmer all day. After the contents have simmered into broth I strain all solids and bones from the broth while it’s still warm. I learned this step is best done while the broth is warm because it often thickens when it’s cool making the bone removal more difficult for the really tiny bones. I want to make sure there are NO bones left in my broth. So I first use a large slotted spoon to take the bulk of the bones out. Then I strain the broth into a large bowl using a strainer to catch the tinier bones. NOW these poor bones are finally ready for the trash! Now that the bones/skin is all removed I pour the strained broth back into my slow cooker. The whole crock of broth goes into the fridge overnight to cool. This process causes the fat that’s in the broth to rise to the top & solidify. I like to remove as much of the fat as I can to make a healthier lower-calorie broth so this step is important for me. In the morning I’ll pull the broth out of the refrigerator and skim the hardened fat that’s risen to the top. Of course you should never put any fat down your kitchen sink. We’re on a septic system out here so it’s doubly important for us. I have a plastic jar in my fridge labeled boldly “FAT” and I use it to hold even tiny amounts of fat from my cooking. When it’s full I’ll tighten the lid tightly and throw it away. Having this accumulated fat sealed in a plastic jar is doubly helpful for us since our tiny trash only gets emptied about every two weeks. Chicken fat in the trash can get mighty odoriferous! WHEW! Thank goodness that jar’s not very full yet because today that jar’s really going to get a workout! I skim the hardened fat off the top of my homemade broth and spoon it into this jar. I don’t spend too much time trying to retrieve every single piece of solids from my broth today because it does add a little flavor. But I remove about 99% of it. After the fat has been removed – BOOM! Homemade broth. Now I just pour the broth into plastic peanut butter jars that I save for freezer food. Yeah, I’ve tried to freeze in glass but I’ve just never been successful at it. Even if I’m using thick canning jars they seem to be too brittle when they’re frozen. Since we have a chest freezer there’s lots of moving food around. One wrong “clink” and we’ve got a big, potentially dangerous mess in the freezer. So until I find a better solution I just use these saved plastic jars for freezing various things such as veggies I canned that didn’t have a full seal after the jars cooled, batch cooking of my favorite Ranch-Style Beans and of course this broth. After the broth is labeled I put them all in the freezer for use throughout the next season. My broth never lasts long since in the winter months I’m constantly using it every week for my endless soup. And that, my dear friends, is all there is to it! It’s shocking sometimes when you find out how ridiculously easy (and inexpensive) it is to provide some things for yourself. Products that you once had to buy from the store. This homemade broth is no exception. I haven’t purchased commercial broth in years. Plus my homemade broth is obviously lower in sodium and unpronounceable ingredients than the store-bought stuff. Give it a try, you’ll be amazed at how easy yet delicious it is! 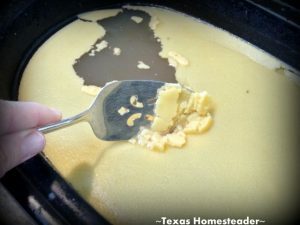 This entry was posted in Blog Posts and tagged Cooking, Environment, Frugality, Make-It-Yourself on October 31, 2014 by Texas Homesteader. I make bone broth in my 6-quart pressure cooker. Not only from a turkey carcass, but also from chicken. I keep a bag in the freezer for the bones and I just accumulate them till the bag is full. I use cottage cheese and yogurt containers instead of those pricy plastic freezer containers. They are shaped so that, with a little hot water from the tap on the bottoms of the container, the frozen contents pop right out, so no having to thaw in advance. I really don’t feel like using these plastic containers in the freezer is harmful as there’s no heat involved. I always cool liquids thoroughly before pouring them into the plastic container. I tried freezing in straight-sided canning jars and had problems with the frozen glass being so brittle that they would be cracked easily. Also there’s the issue of having to thaw in advance. I’ve had jars crack while sitting on the counter thawing. I’ve found that, after I’ve drained my broth from the bones, if I add a little hot water to the drained bones and stir them around a little, that will produce a “second broth” that still has a lot of flavor in it. After being pressured for an hour the bones are very soft and will crush between your fingers. I bury these bones in my garden, along with other kitchen scraps. Now, the fat, I save and use when I fry chicken. I keep it in a container in the freezer and use it several times. I’ve made soap with it, but the end-product is a little softer than soap made with, say, beef tallow. Even if it’s been “washed” it still emits a “chicken-ey” flavor, which decreases after it has cured, especially if essential oil is added to the soap. But it does turn the soap yellow. I’ve also blended it half and half with pork fat, which I save also, and used that to fry potatoes in. I don’t notice a chicken-ey smell then. I don’t like to put fats into the soil. Sometimes I’ll put small amounts in the trash that we burn in a barrel, we’re allowed to burn as we’re outside the city limits. Otherwise, if I have some I need to get rid of, I’ll do like you, put it in a peanut butter jar. Our neighbor has a dumpster at his place of business and lets us put our non-burnable trash into it. I also deglaze my pan whenever I brown hamburger or fry pork. Lots of flavor there. I freeze the liquid till I’m making soup or beans. Save the fat. Beef fat makes wonderful soap. Pork fat can be used like lard. When I buy pork, it’s almost always a whole loin, which I slice and cook the slices like pork chops. So much more nutrition in that than those bony, fatty chops. I also cube some for use in dishes like sweet and sour pork that call for cubed pork. I have used my meat grinder and ground some of it, along with whatever pork fat is on the loin, and seasoned for sausage but it made sausage that was very, very dry and so really about all I could use it for was in breakfast casseroles and pizza, or mixed half and half with ground beef for meat loaf. Love this Ilene – thanks for sharing what you do! I’ve not yet gotten to using tallow or fat for soap, but it’s something I’m considering trying in the future. Great tips! I hadn’t heard that about the vinegar. That’s interesting. I do something similar with my chickens and large roasts so I can’t get as many meals as possible out of them. Some homemade chicken broth sounds really tasty right now too. Ugh, I had a long comment but apparently mistyped the captcha 🙁 Thanks for bringing this post back to our attention – very timely! I hadn’t head of the vinegar trick, but it makes sense. I would also love to can the broth (duh! I hadn’t thought of that before!) but we would need to have ‘excess’ and it hardly lasts that long, lol. Another trick I read years ago is to roast the bones and whatever’s on them until they are browned, then make the broth. The broth is a beautiful golden brown color and (I think) tastes a little richer. We feed all the skimmings from the broth (bones, skin, etc) to our chickens – they love to pick the bones clean and it’s a nice little treat in the winter months. That’s a good point Laurinda. We don’t feed our mini Schnauzer any ‘people food’, she’s prone to bladder stones so she’s on a very strict diet. But it sounds like a way for many folks to use the rest of those scraps! I make my broth basically the same way but the next time I make it I will add some vinegar. I bought two already cooked chickens because they were so cheap. I took off most of the meat but left some on the bones. I put it in the slow cooker with some celery tops (I would have thrown away) and carrots. When it is done, I strip the meat off and divide it into two piles with the carrots and give them to our dogs. They know it is coming and do not leave my feet. I put the broth in plastic freezer bags and freeze them flat. After they are frozen I stack them like a file and put them in the freezer standing up. Thank you for the hint about the vinegar. LOL. Pups licking their chops in anticipation! I can just see it now Patty! Great Idea to freeze them in plastic jars!! Thanks for sharing on My 2 Favorite Things on Thursday!! Hope to see you again! Pinned! It sure works well for us Elaine – thanks for the pin. There is good information about the negative effects of freezing in plastic, just as plastic in the microwave is not recommended. Freezing in canning jars is also not recommended, just like microwaving your mason jars, because it changes the molecular structure, making them more likely to break when using them to can foods. If you want to use them in either freezer or micro buy a case and mark them with a little nail polish to identify them for those uses. My bone broth is incredible, I lightly smoke the bones before making it. The flavor is incredible. And I don’t skim off the fat. The natural fat isn’t harmful and the flavor you get from ALL the parts is over the top good! The Ball Home Canning and Preserving canning book has the times for pressure canning, I think it’s 75 minutes. Try it smoked, it’s amazing. Pingback: MYO Cream-Of-Chicken Soup In A SNAP! I have been doing the chicken or vegatable bone broth or sometimes called “bone soup” for a while now. And have 6-8 pints stored on the shelf. Last week I had cooked down the bones from a rack of baby ribs and and after straining I put the broth in the frig for a few days until ready to use it. There was not a lot of fat on it so I left what there was in it, heated it up a bit and put it in my small 4 qt crock pot to cook the beans I had soaked for a day, to make what the recipe said was to be white chili(I used northern, some red chili, and garbonzo bean. Then I changed things around a little more and added a dehydrated onion, chili powder, garlic cloves, some tomato w/chillis, some canned tomatoes and even add a pt of thickend tomato puree. And rounded up partial jars of canned onions with juice. Stirred away at it and then added a qt of canned canned, chopped up turkey. Oh, I had to transfer the mixture to a large pot in order to add the turkey. Then let it cook and “meld” the flavors before canning in pressure cooker. Ended up with 11 pints of what I call extra good turkey chili. Who needs a recipe? I read somewhere that when using glass jars in the freezer you need to use ones that have no shoulders before the lid. The ones that have completely straight sides. The curved glass on the shoulders is weaker and prone to cracking when frozen. I would also say that tightly packing them in a container/crate of some sort would reduce the clink factor and breakage. Every thing is better when you make it from scratch!! and better for you!! Thanks for sharing on My 2 Favorite Things on Thursday!! Hope you come back and share some more… I love having you!! I love making our own broth….. I love using it even more! Thanks so much for sharing on the (mis)Adventures Mondays Blog Hop. I look forward to seeing what you will share next. I use a lot of chicken broth. I am going to have to start doing this! We are on a septic system too so I love the tip for keeping the fat in a plastic container until it’s full and can be thrown away. Thanks for linking up again at This Is How We Roll Thursday. Love your posts! Thank you for sharing your stock secrets! I used to make my own bone stock and would can it to save freezer space, but I have been vegan for the last three years, so I am no longer doing bone stock 🙂 , but I do save all my onion skins, vegetable ends, peels and scraps and put them in a bag in the freezer so that they can be added to the pot when I am making vegetable stock. I periodically go through the bins and bags of root crops and pick out the ones that are getting soft or growing tops and put them in a crock pot with water to cover. I just roughly cut the vegetable culls so that they fit in the pot, but spend very little time doing so. I usually add seasonings and maybe cut a head or two of garlic in half and add it to the stock. I let it cook until all the veggies are putty and then strain and store in reusable plastic storage containers that are stackable. I have a milk crate in my deep freeze that holds a variety of stocks to keep them all in one place for easy access and so I don’t lose them amongst the other goodies in my freezer. I have a basic clear stock made from vegetable scraps like celery ends and tops, onions, garlic, various greens, cabbage cores, broccoli stems etc., I also have a mushroom stock,( This is not a scraps stock.. it is made fresh, but it is de-elish!, recipe and instructions can be found on my blog. I can give you the link if you are interested), and a rich golden stock made from roasted root crops that I make from tired carrot, turnips, potatoes, garlic and sweet potatoes. Like you I keep a perpetual soup pot going so having stock to add to it is very useful and cost effective! Ok I didn’t read all the comments here, but did you know you could use the extra fat for your garden? One problem would be attracting scavengers, but you could bury it. I don’t have a problem with raccoons and whatever because I have dogs, but my dogs could be a problem for this lol. I sometimes ha e a mess of compost but I’m not too worried as my hubby is a hoarder, so he makes a bigger mess than the dogs, haha!! Pingback: Fall-Back Friday: MYO Chicken Broth - Easy & Healthy! That’s exactly what I do with the carcass. It has such a wonderful flavor! I also throw some sea weed into my broth for the extra goodness! Great post. Thanks for the tip on the vinegar. Our local PTO has one fundraiser each year called Harvest Dinner. It is a traditional Thanksgiving meal, and the whole community chips in. This year I cooked three 22-pound turkeys and boned them out. That left me with the carcasses, which I promptly made into turkey stock the next day. I have two large chest freezers, and they are full (a blessing!). Anything that I can process and have it be shelf stable goes into my canner. I made 17 quarts of yummy stock. I love that I don’t have to plan ahead and thaw the stock. In fact, the cold months are my favorite time to can. The past two days I have cleaned out the soup bones from our last steer that we butchered. I made beef stock. It is wonderful to be able to simmer it all day, and then stick it outside overnight (in our teen temperatures) so I don’t have to worry about it heating up my fridge. The Ball book says 20 minutes for pints, 25 for quarts for both beef and poultry! I love making my own chicken broth. Since I make a lot of soups during the winter months, I usually use quite a bit of stock and I find homemade always tastes better. Thanks for sharing your method on Merry Monday. For mine, when I boil chicken to shred, I take that opportunity to flavor the water and make my broth. Thanks so much for being an awesome part of TYSH! See you next Tuesday. HUGS! I love making my own chicken broth too! I’ve always used a stock pot, but last time, I just used my slow cooker – it was really nice to just turn it on and forget it. I find it hard to keep enough around too – even when I freeze it. We tend to use it up pretty fast, then…time to make more! 🙂 Thank you for sharing with us at Wake Up Wednesday! I’m not sure why you have trouble freezing in canning jars, but I do know that all canning jars are not created equal. When you buy jars you need to make sure the box says for home canning and freezing. I know that Ball has limited sizes and types that are good for freezing. The largest freezable Ball jar is the 16oz wide mouth jar. I have used the 16 oz wide mouth & 8 oz regular mouth jars in the freezer numerous times ; I have a chest freezer which means things get stacked and jostled around all the time, yet never had breakage. Great idea using empty Peanut butter jars for storage. I’ll have to remember to save mine next time. Happy Halloween Yuppers; easy peasy if a person just took the time. I make mine the same way but sure didn’t know about the vinegar thing. Thanks for the tip and will be adding that from now on. I do see some Chicken Noodle Soup in the future. Also on septic system here which took some getting used to after moving to the country life from the Arlington city life. All my scraps I put in empty potato chip bag or cereal bag and stored in the freezer till trash day. Any throw-away liquids in put in empty butter or cook whip containers, frozen and then emptied into that scrap bag. The bag will break down in the land fill easier than plastic containers. All my plastic, glass, cans, plastic bags etc. is taken to Target and put in their recycling bins that they have inside the store; along with our old ink cartridges. Paper products are taken to the recycling paper/cardboard dumpsters that are located throughout Mansfield. Oops; sorry, kinda got off the chicken broth subject. Enjoy your day and have a enjoyable and wonderful weekend. 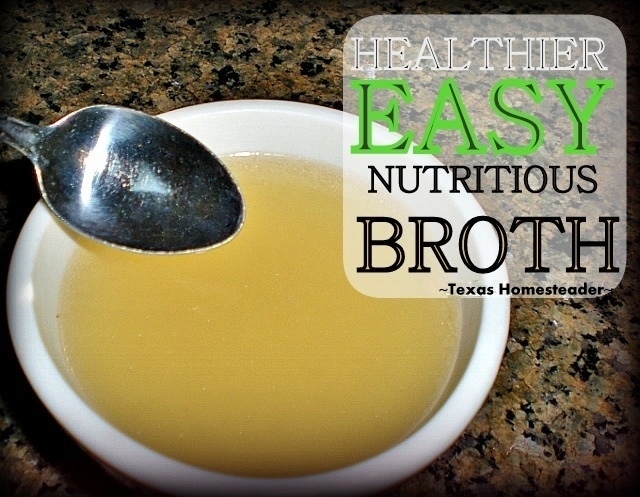 We love bone broth!! It’s one of the healthiest foods you can make and how easy it is and I also use about 3 T of apple cider vinegar. I DON’T remove the bones however. I turn our slow cooker on high the first day for about 4 hours, then I turn it back down and allow it to do it’s “thing” for another 2 days. On the second day I add some ginger or garlic , onions, celery, and carrots. I’ve noticed that my onions rings float to the top and burn in the fat that’s at the top so I’m not sure how to get around that issue unless I put the onions in whole so they sink to the bottom and stay there or just don’t put them in until a few hours prior to removing them. At the end of the 3 days, the bones have broken up and are VERY soft and the wonderful marrow is seeping out -for the bones that are still in one piece, I mash them with a fork and leave them in the broth (or eat them on the spot!) and also give them to my dogs who anxiously wait for them as they love the marrow and it’s great for them too! If anyone is doubting this – read some of the Dr. Weston Price material.